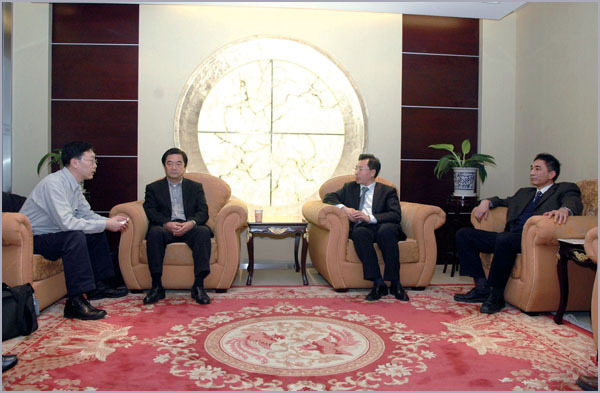 President Liu Jingzhen and vice president Zhao Haiming of CNIACO met with a delegation from TRINITY AUTOMOTIVE（Japan） headed by its administrative supervisor Mr. Naoyuki Arakane at the headquarters of CNAICO on February 10th, 2009 in Beijing. In a friendly atmosphere, the two sides recalled their cooperation in the exportation of motor vehicle and agricultural machinery from China over the past years, reviewed the on-going business, summarized experiences from previous projects, discussed about the possible application of newer and more flexible cooperative manner for the future and put forward the cooperative operation goal of 2009. President Liu said that with long-term close collaboration and mutual efforts by the two sides, good results had been gained and 2008 in particular saw a greater progress in trade volume comparing with the last few years but both sides should continue their efforts to deepen their cooperation and break the limitation of the current scope of products on the basis of summarizing the experiences and lessons. He also expressed hope that the two sides could join hands to enter into new segments of market with new products and promote cooperation in a diversified way. Mr. Naoyuki Arakane was highly in favor of President Liu抯 suggestions and affirmed continuous efforts from Trinity Automotive to work together with CNAICO to explore new business fields with new products while ensuring the steady growth of existing products to be exported. During the meeting, President Liu made a brief introduction about the business performance of SINOMACH and CNAICO. The visiting guests expressed appreciation for the development of them.